Contest: Win $400+ Valued Set (2 Vaporizers, 1 Premium Bong, 2 CBD Oil (500mg, THC Free) Applicators from Vapor Slide 4 Winners 4 Prizes! 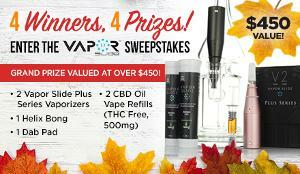 Win $400+ Valued Set (2 Vaporizers, 1 Premium Bong, 2 CBD Oil (500mg, THC Free) Applicators from Vapor Slide 4 Winners 4 Prizes! Prize: 4 lucky will win premium products valued at over $400. Statistics: This contest was opened by 155 and entered by 9 ContestChest.com members. 6% of those who opened the contest, entered it.